Ninjato swords were typically used by ninjas of feudal Japan. The Black Warrior Ninja Sword is a very intimidating sword, crafted to help you blend into the night! The blade is constructed of carbon steel that has been heat tempered and offers a black finish. The handle offers a black cast metal guard, pommel and menuki, while the hilt sports imitation black ray skin and black cord wrapping. The sword is sharp, it has a metal guard, the handle is long, and it comes in a nice box. I have not used it yet so I am not sure how sturdy it may be. Not a bad BOGO deal, but I wouldn't pay $30 for just one. Not sharp at all; you'll need to put an edge on it. Blade is fairly thin, but does appear to be full-tang. Menuki pegs are plastic; just push-throughs that appear to be part of the plastic decorative pieces under the cord wrap. Handle material appears to be plastic, not metal. Overall, it looks nice and has decent balance. I wouldn't use it to cut anything though. Saya is actually made of wood. As stated before, not a bad BOGO deal just for goofing around. 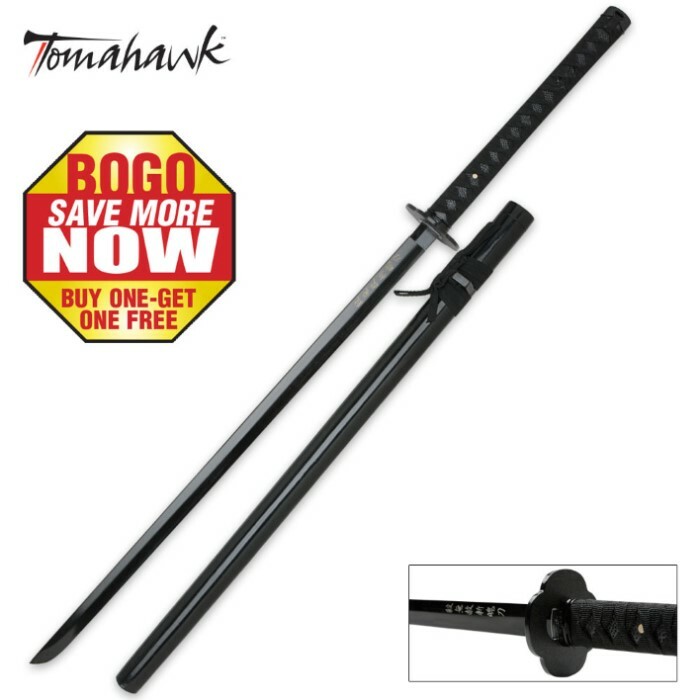 For $10 more though you can get a Musha or Musashi that is truly a "real" sword. I bought this (from another website but same sword) and it bent when i tried to lightly hit cardboard. But its a beautiful sword.